Harold Kurzman, board member and great-grandson of Isidor and Ida Straus, gave two lectures at the Renaissance Academy of Florida Gulf Coast University about his family legacy. The first two part lecture took place in Bonita Springs on October 20 and 27, from 10:30 to 12 pm. The second two part lecture took place in Naples on November 13 and 20 from 10:30 to 12 pm. The description of the lecture from the course catalog is below. Joan Adler and Catherine Smith were invited to Georgia for series of presentations about the Straus family and and about Joan Adler's book, For the Sake of the Children: The Letters Between Otto Frank and Nathan Straus Jr. They also attended the annual Harvest Days in Old Talbot Weekend. 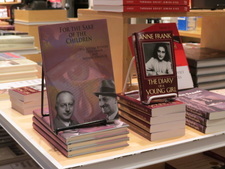 On November 1, 2015, at 2 pm, Joan Adler gave a presentation about her book, For the Sake of the Children, at the William Breman Jewish Heritage Museum. Thank you to Jeremy Katz and Aaron Berger for helping put together this event. 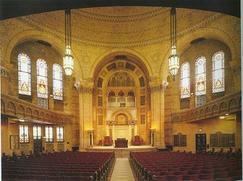 We hope to return again soon for a presentation about the Strauses Southern Jewish experience. On November 2, 2015, at 7 pm, Joan Adler gave a presentation entitled, "From Pushcart to Macy's" about the history of southern Jews for the Temple Tribe of the Southside. This talk took place in the home of James and Judy Freeman and was attended by over 30 people. To read more about this event, read an article written for the Atlanta Jewish Times. Thank you to Don Thomas for arranging and promoting this event. 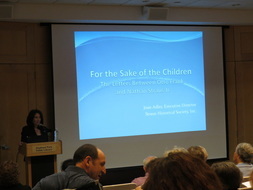 On November 4, 2015, at 5:30 pm, Joan Adler gave a presentation about her book, For the Sake of the Children, at the University of Georgia. 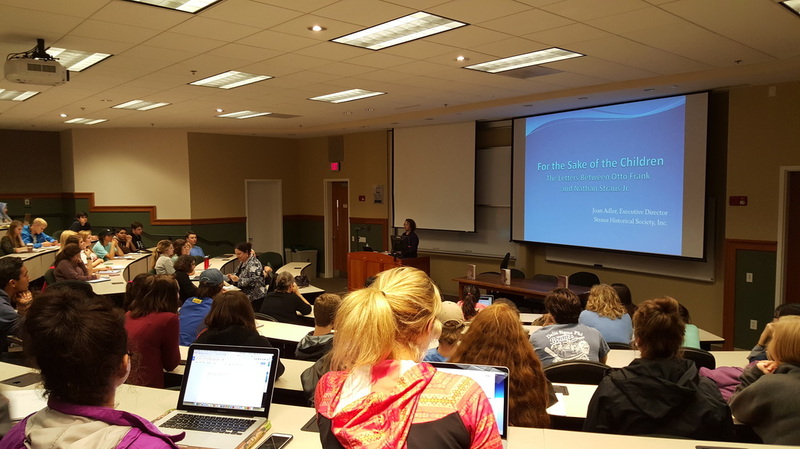 In the classroom of Dr. Marjanne E. Goozé, Associate Professor of German in the Germanic and Slavic Studies Department, Joan spoke to a group of over 70 students. Thank you to Dr. Goozé and Kristina Petti for organizing this lecture. Joan Adler and Catherine Smith, were invited to Georgia the Harvest Days in Old Talbot Weekend. "Harvest Days in Old Talbot" is the seventh annual weekend hosted by Michael H. and Debbie Buckner of the Patsiliga Museum in Junction City, GA.
Joan and Catherine set up photographs, books and other informational materials in the dining room. During the weekend, over 180 people passed through the property to enjoy the old world charm of this incredible Georgia home. We would also like to thank Dottie Cohen & Joel Friedman, Dickie and Julie Straus, and Mike & Debbie Buckner for their hospitality during this trip. On October 25, 2015, at 2 pm, Joan Adler gave a presentation entitled, "The Greenebaum Family: From the Rheinpfalz to Chicago" at the meeting of the Jewish Genealogical Society of Illinois. 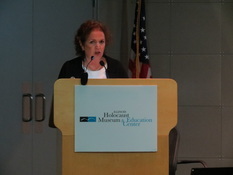 This event was co-hosted by the Chicago Jewish Historical Society. With well over 100 attendees, Joan gave an interesting talk about the Greenebaum family, a part of the Straus family that was very prominent in the Chicago area. Thank you to Sandra Schon Kiferbaum, Membership Vice President, Marcey Siegel, Membership Co-chair, and Martin Fischer, Former Publicity Chair, of Jewish Genealogical Society of Illinois, and to Jerry Levin and Beverly Chubat of the Chicago Jewish Historical Society. We would also like to thank Jim and Lili Greenebaum for their hospitality. On July 8th, 2015, from 10-11 am, Joan Adler gave a presentation about the Straus Family at the Greens at Half Hollow, a community in Melville, New York. The powerpoint talk was given to the Men's Club and was attended by more than 100 men and women from the community. Following the presentation was a stirring and interesting Question and Answer session. Thank you to George Borsuk and the Men's Club for hosting us for this presentation. We hope to return again in the future. The presentation was attended by a very interested and informed group. Thank you to Susan Olsen of Woodlawn Cemetery who put this event together. We hope to return to the cemetery in the future for more events! In early May, Joan Adler and Catherine Smith were invited back to Chicago for a series of events and presentations relating to the history of the Straus Family and Joan's book For the Sake of the Children: The Letters Between Otto Frank and Nathan Straus Jr. These events took place between May 6th and May 11th. 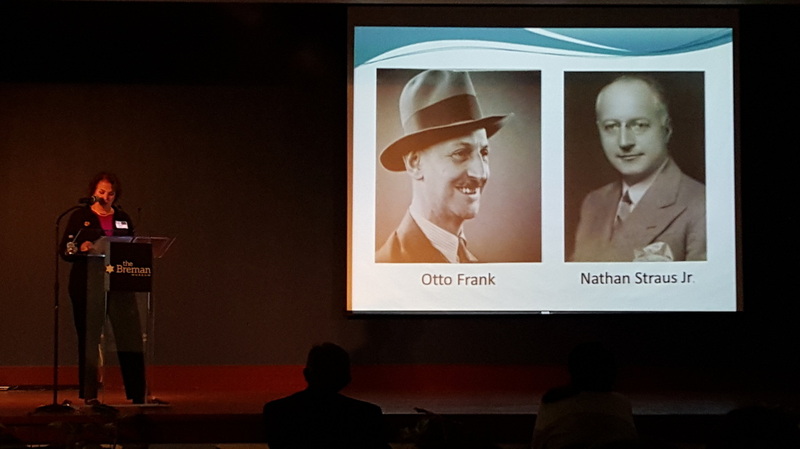 On Wednesday, May 6th, The Highland Park Public Library hosted a presentation by Joan Adler about her book For the Sake of the Children: The Letters Between Otto Frank and Nathan Straus Jr. The presentation was in conjunction with Writers Theatre's "From Page to State Program." Michael Shaw, the Box Office & Sales Manager with Writers Theatre spoke briefly about their latest production, "The Diary of Anne Frank," which had been so well received, it was extended until August 2. Beth Keller, the Marketing Specialist for the Highland Park Public Library, then introduced Joan. The presentation was well attended and well received. Thank you to Beth Keller, Michael Shaw and everyone at the Highland Park Public Library and the Writers Theatre for their efforts and collaboration. On Thursday, May 7th, The Illinois Holocaust Museum and Education Center hosted a presentation by Joan Adler about her book For the Sake of the Children: The Letters Between Otto Frank and Nathan Straus Jr. The program began at 6:30 pm with an introduction by Amanda Friedeman, the Harvey L. Miller Family Youth Educator. After the powerpoint presentation, Joan was available to sign copies of her book, which were for sale in the Legacy Shop. Thank you to Lillian Polus Gerstner, Amanda Friedeman and everyone at the Illinois Holocaust Museum & Education Center for making this program such a success. On Friday, May 8th, KAM Isaiah Israel Congregation hosted a presentation by Joan Adler about her book For the Sake of the Children: The Letters Between Otto Frank and Nathan Straus Jr. After Shabbat services, Joan was introduced by Rabbi Frederick Reeves. Her presentation, including a powerpoint, was well received by the interested congregation. Thank you to Rabbi Frederick Reeves, Brian Zakem and everyone at KAM II for helping us share this remarkable story with the community of Hyde Park. 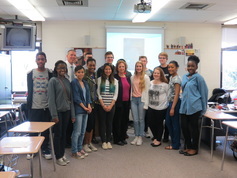 On Monday, May 11th, Joan was invited to speak to two Advanced Placement United States History Classes at Homewood-Flossmoor High School. These classes were made up of sophomores who had learned about the American response to the Holocaust. History Professor Mr. Jon Elfner introduced Joan who then discussed her book, For the Sake of the Children: The Letters Between Otto Frank and Nathan Straus Jr. The class was invited to ask questions and make comments about what they had learned. The students were very attentive and interested. Thank you to Mr. Paul Kolimas, the Social Science Department Chairperson, Mr. Jon Elfner, Brian Zakem, and all the students of Homewood-Flossmoor High School for giving us a platform to reach younger generations. 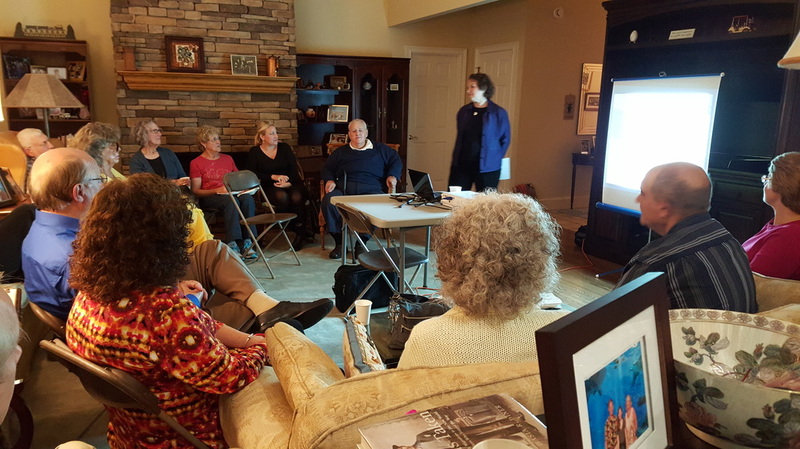 On Thursday, January 22, the Bloomingdale Neighborhood History Group hosted a presentation by Joan Adler. 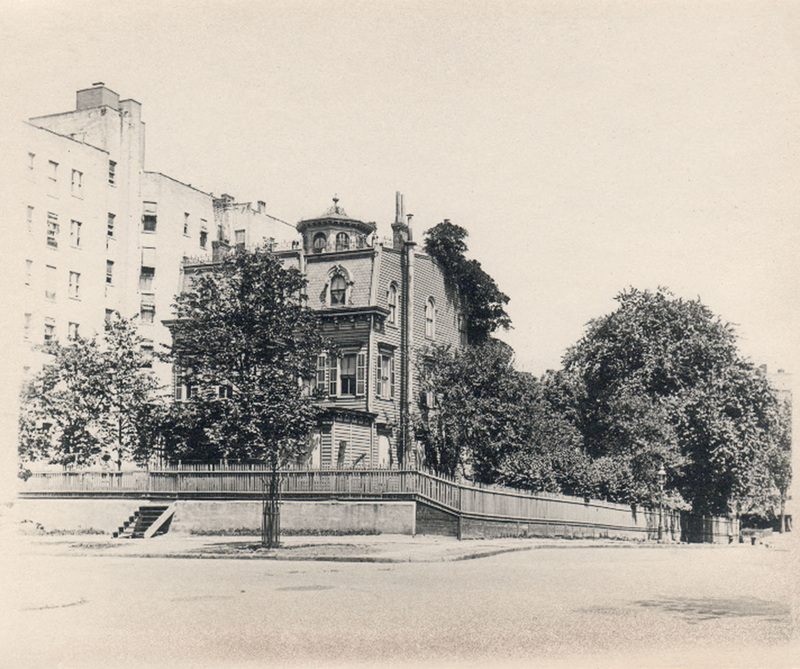 Held at 6:30 at Hostelling International, Joan presented an in depth look into the Straus family's connection to the Bloomingdale Neighborhood and their history in New York City. With over 100 people in attendance, the presentation was well received and an interesting Q&A was conducted following the talk. Joan was then available for a book signing and meet and greet. Thank you to Batya Miller, Jim Mackin, and Al Berr for facilitating this presentation.